Lush Eau Roma Toner Water oh how I love thee. Have you ever used a product and instantly understood what all the hype was about? You have? Cool! Well for me that was and is Lush Eau Roma Water. A simple product that essentially combines both lavender and rose water. The lavender hydrates and soothes where as the rose water calms and can help reduce redness. The redness aspect I can't comment on as that isn't something I typically suffer from but I do find a quick mist to be refreshing and soothing in one quick step. A few days ago myself and a friend happened to be sunbathing (in Scotland, I kid you not ha!) and by the time we went back indoors her skin was looking a little red. To cool and calm her skin she misted on my bottle of Lush Eau Roma Toner Water on her face/chest and said she felt that it took the sting out of her sun burn. 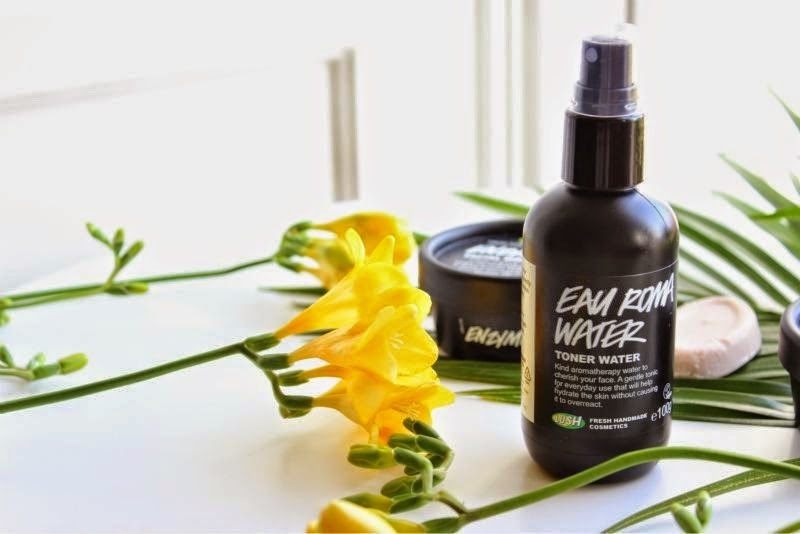 Obviously be safe in the sun (shade, factor 30 and hat - you know the drill) but it is good to know that this toning water has lots of uses none the less. Personally I like that I can use this whenever I wish to re-freshen without it being too wet - you know the story, you mist on a facial mist and bye bye make-up, hello being mistaken for Gene Simmons. Yet the same toning water can be used after cleansing to close the pores and ensure every little scrap of cleanser/make-up is gone. It is so gentle that it can even be used around the delicate eye area without irritating the eyes, I have been known to mist a little on to cotton pads to ensure every little scrap of mascara is gone. I didn't think I would be a huge fan of this and yet I would recommend it to everyone. As a side note I have the smaller bottle of Lush Eau Roma Toner Water and have used it like there is no tomorrow since receiving it around three weeks ago and there is easily half a bottle left. If you plan on carting your bottle around in your bag for the sake of your shoulder I recommend this size! Lush Eau Roma Toner Water £3.95-£7.50 via Lush - link.